You might have noticed that I have not reviewed a lot of DC Comics here on the 365 quest. DC has never really been my thing. I mean, I dig Batman, but that’s about where my DC reading road ends. But that’s all about to change because until next Sunday, it’s a DC title a day! Get ready! If you do not have much exposure to DC titles, join the club and follow along as I dive right in…eleven days in a row. One of the main reasons that I wanted to read more DC books is to have better discussions with my friends. I do have a fair share of friends and students that read DC titles, and since I’m known as a comics guy, they want to talk to me about them. The Flash: Move Forward Vol. 1 from the New 52 is when I land today. I have a good friend that helped me pick out a lot of the DC stuff that I will be reviewing this week, and he’s a big Flash fan, so why not get some Flash in the mix early? I’ll use this review to comment on what our students are getting as fiction these days: pure awesomeness! Let me explain…and I’ll probably be speaking to this a lot in the next year. There has been a very large push toward non-fiction in the classroom from middle school on up, and some people are worried that our kids are losing touch with discussing quality fiction. I say, not a chance! Have you seen television these days?? All of our kids have smartphones and tablets, and they are watching quality programming all the time because there is so much out there! I know some of it is garbage, but I do engage in discussion with them about what they are watching, and it’s high quality writing and production. That brings me to this Flash book. The story is great. It’s a thinker with intense action and quality characters. Yeah, it does drop in a villain or two that many non-DC readers might not know, but it’s not a big issue; most of the characters are given enough of an introduction, and the rest, well, maybe they will in the next trade. 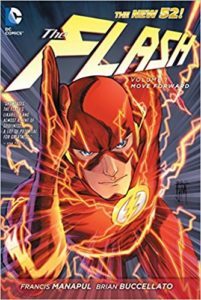 The point is, this Flash book is yet another example of the type of quality fiction that we are going to want our kids reading. I could argue that putting your finger on the more complex plot points in this trade is more difficult than finding some of the symbols in Of Mice and Men. We are living in a golden age of fiction, and I think that if this Flash book were the first DC book that you had ever read, you’d agree with me that the complexity is inspiring.